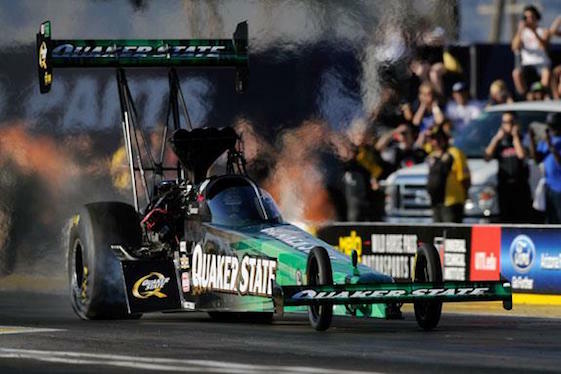 Leah Pritchett will be back in a Quaker State dragster this weekend. Leah Pritchett’s patchwork NHRA Top Fuel schedule will continue this weekend during the 29th annual NHRA SpringNationals near Houston, where the recent national event winner will reunite with her Bob Vandergriff Racing team via sponsorship from Texas-based Quaker State. Pritchett, who won her first Top Fuel event in Race No. 2 of the Mello Yello Drag Racing Series near Phoenix on Feb. 28, was left without a ride when team-owner Vandergriff Jr. unexpectedly announced his retirement three weeks ago. “I’m so grateful to have growing relationships with sponsors like Quaker State and FireAde that stand behind us, share common goals and work hard with me to keep in the game,” said Pritchett, whose team at Royal Purple Raceway in Baytown will be led by veteran crew chiefs Mike Guger and Joe Barlam. Doug Kalitta (Top Fuel), Ron Capps (Funny Car) and Houston native Erica Enders (Pro Stock) are the defending event winners heading into Round 6 of the 24-event schedule. The first two of four rounds of professional qualifying is scheduled for Friday afternoon. Pritchett, 10th in driver points, posted her breakthrough NHRA Top Fuel victory in an historic all-female final against current point-leader Brittany Force during the 32nd annual CARQUEST Auto Parts NHRA Nationals at Wild Horse Pass Motorsports Park in Chandler, Ariz., near Phoenix. Pritchett vs. Force took place 34 years after Shirley Muldowney faced Lucille Lee in the first all-female Top Fuel final at the 1982 Springnationals at National Trail Raceway in Columbus, Ohio. Pritchett was hired during the offseason to replace three-time Top Fuel world champion Larry Dixon, who finished fourth in the point standings in 2015. Pritchett was teamed with former Pro Stock regular Dave Connolly, whose C&amp;J Energy Services dragster team also was shut down by Vandergriff, who retired from the Top Fuel ranks in 2014. “Right now, I’m focusing at a pace quicker than my 320-mph dragster on locking in one race at a time. That is the immediate goal,” said Pritchett, who drove with Lagana Racing last weekend during the unique NHRA Four-Wide Nationals at zMAX Dragway in Concord, N.C., near Charlotte. “Competing at back-to- back races while finding and creating proper funding has undoubtedly brought an elevated level of difficulty to the mix,” said Pritchett, 27. “But a shout-out of thanks is in order to all of the business professionals in our drag racing community that have shown support and been open to exploring opportunities with my partners to keep me on the track. Friday, April 29, FOX Sports 1 (FS1) will televise one hour of qualifying highlights at 8 p.m. (EDT). Saturday, April 30, FS1 will televise one hour of qualifying highlights at Midnight (EDT). Sunday, May 1, FS1 will televise three hours of finals coverage at 5 p.m. (EDT). John Force, 7, FC; Warren Johnson, 6, PS; Jeg Coughlin Jr., 4, PS; Tony Pedregon, 4, FC; Kenny Bernstein, 3, TF; Ron Capps, 3, FC; Larry Dixon, 3, TF; Mike Edwards, 3, PS; Bob Glidden, 3, PS; Cruz Pedregon, 3, FC. Top Fuel _3.726-seconds by Tony Schumacher, April ’15; 330.07 mph by Spencer Massey, April ’15. Funny Car _3.988-seconds by Jack Beckman, April ’15; 320.81 mph by Matt Hagan, April ’15. Pro Stock _6.519-seconds by Jason Line, April ’15; 212.66 mph by Mike Edwards, April ’13. Top Fuel _ 3.680-seconds by Antron Brown, Aug. &#39;15, Brainerd, Minn.; 332.75 mph by Spencer Massey, Aug. ’15, Brainerd, Minn. Funny Car _3.879-seconds by Jack Beckman, March ‘16, Gainesville, Fla.; 331.45 mph by Matt Hagan, Nov. ’15, Pomona, Calif. Pro Stock _ 6.455-seconds by Jason Line, March &#39;15, Concord, N.C.; 215.55 mph by Erica Enders, May ‘14, Englishtown N.J.
Top Fuel _ 1. Brittany Force, 428; 2. Antron Brown, 365; 3. Doug Kalitta, 344; 4. Clay Millican, 318; 5. Steve Torrence, 310; 6. J.R. Todd, 289; 7. (tie) Terry McMillen, 242; Tony Schumacher, 242; 9. Richie Crampton, 240; 10. Leah Pritchett, 220. Funny Car _1. Robert Hight, 369; 2. Ron Capps, 361; 3. John Force, 352; 4. Tim Wilkerson, 334; 5. Courtney Force, 322; 6. Del Worsham, 318; 7. Jack Beckman, 307; 8. Alexis DeJoria, 277; 9. Chad Head, 270; 10. Cruz Pedregon, 238. Pro Stock _ 1. Jason Line, 583; 2. Greg Anderson, 481; 3. Bo Butner, 429; 4. Drew Skillman, 343; 5. Chris McGaha, 287; 6. Allen Johnson, 244; 7. (tie) Jeg Coughlin Jr., 223; Erica Enders, 223; 9. Vincent Nobile, 209; 10. Alex Laughlin, 187. Pro Stock Motorcycle _ 1. Eddie Krawiec, 232; 2. Andrew Hines, 197; 3. Hector Arana, 154; 4. Chip Ellis, 135; 5. Jerry Savoie, 108; 6. LE Tonglet, 107; 7. Michael Ray, 104; 8. Matt Smith, 93; 9. Angelle Sampey, 92; 10. Jim Underdahl, 84.